This is the Naya Pakistan which promised us to put the interests of the youth forward – but has anyone noticed what is happening in Peshawar? The University of Peshawar students are protesting due to the semester fee increase. On Thursday, 4th October 2018, the police was involved to mediate the protests. However, the brutal attacking of the police led to students being arrested and severely injured. According to the PR officer at Khyber Teaching Hospital, 6 students were injured and were taken to the hospital for medication. Alongside this, 28 students were arrested by the police under the violation of section 144 Criminal Procedures Code in the light of staging the protest. It has also been shared that during the clash, three policemen were injured. 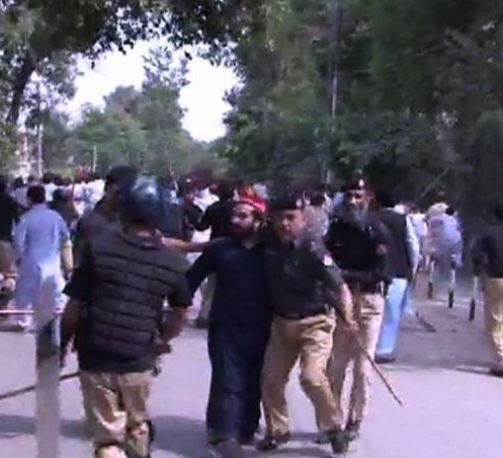 The Muttahida Tulaba Mahaz was behind staging the protest in the University of Peshawar. The protest included student wing members of Islami Jamiat Taleba (IJT), Pakistan Peoples Party (PPP), Awami National Party (ANP), and Muslim Students Federation (MSF), conclusively making the Pukhtoon Students Federation (PSF). The strike started from the Pearl Lawn of the university. “These students were trying to blackmail us [the university administration]. Two outsiders, both of whom are graduates, are leading these protests. One belongs to the IJT and the other to the PSF. Their aim is to find a way to blackmail the administration whilst using innocent students as a shield. “We gave them five hours to register their protest. We listened to them, provided them with [campus] space. We asked them to sit down [for talks]. They staged their protest and raised slogans; the media also came to cover it,” the spokesperson said while recounting the day’s events. Let’s hope the government steps up mediates the situation – students need to be treated like students, not criminals behind bars and students must also act like students. But before that, the university needs to step up.